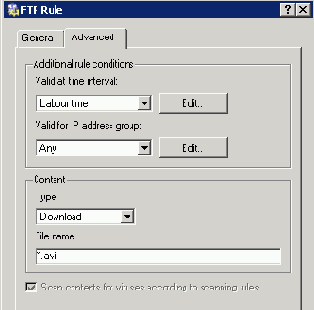 Warning: The FTP policy refers to all FTP traffic that is processed by the FTP protocol inspector. In the following example, we intend to enable the local FTP server from the Internet. The Forbid upload rule denies even upload to this server which is not always desirable. For this reason we must add a rule that would enable upload to this server before the Forbid upload rule.